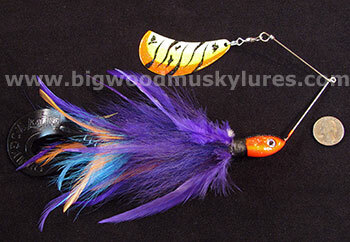 Description: Musky Safari Serial Killer spinnerbaits are simply not your average Muskie spinnerbait. 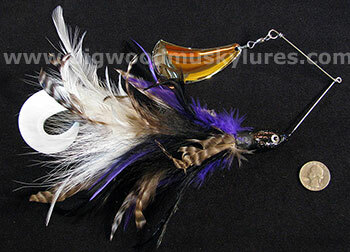 Nearly everything about these baits are different, from the blend of hackle feathers and hair in the skirts to the hand painted #8 Hatchet Blades that send out big and unique vibrations! 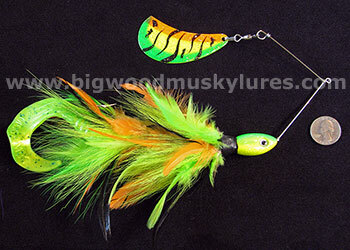 All the work is done "in house" at Musky Safari Tackle company so that strict quality measures can be maintained. 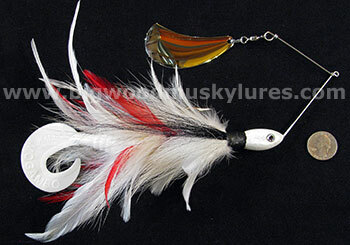 Excellent baits to slow roll over deeper weedbeds or to effectively work drop off's. 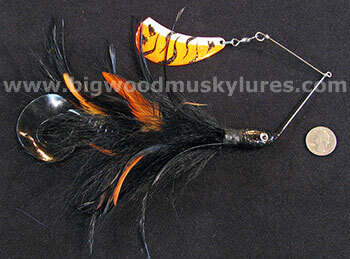 The two single hooks on the Serial Killer make them naturaly weed resistant and the generous ties of hair and hackle serve to push weeds around the hooks enableing savvy fishermen to put these baits where the fish are. 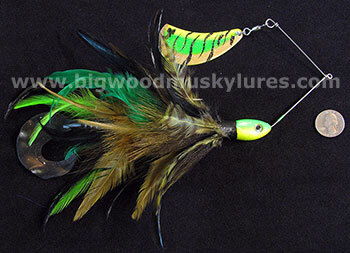 12" with 2 oz. heads. Overall weight around 3 oz..